Imagine what the unemployment rate would look like if unemployment benefits were universally $150,000 per year. My guess is we'd have a heck of a lot more unemployment. Common sense and personal experience indicate higher unemployment benefits will make unemployment less unattractive and thereby increase unemployment even in the Great Recession. Can't argue with that. True, unemployment benefits aren't actually $150,000 a year—about three times the median household income in 2008. They're closer to just $300 a week, or $15,600 a year. This hypothetical argument that supposes the exact opposite of reality, that one could on average make much more money by being unemployed, is nevertheless irrefutably compelling. What really persuaded me, though, was this graph that Laffer and the WSJ supplied to bolster the argument that "since the 1970s there's been a close correlation between increased unemployment benefits and an increase in the unemployment rate." 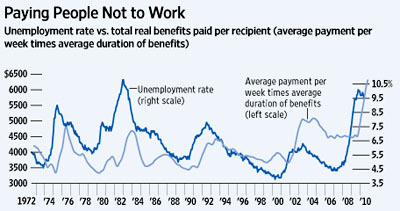 The correlation is indeed close—with increases in unemployment benefits lagging spikes in unemployment by a year or so. This can only mean one thing. Those unemployed layabouts are using some of their $150,000 a year incomes to lounge around in Hot Tub Time Machines, jump back in time and get themselves laid off and so that they can soak up all that sweet, sweet government gravy. Laffer is apparently not alone in his profession in believing that time travel is a major influence on the U.S. economy. Nobel laureate economist Edward C. Prescott recently stated at the Society for Economic Dynamics meeting in Montreal that Obama caused the current recession, which is a neat trick because the recession started in December 2007. In summary, then, the keys to time travel are: (1) Lose your job. (2) Study economics.